They followed up that statement with a quick, “That was a Canadian ‘eh’, not a Michigan one.” and then some manic giggling. Glad to see my kids are working on their regional accents. That challenge, even though it wasn’t directly delivered to me, got me to thinking. If I could make regular old American bacon, why in the world couldn’t I make some fabulous North-of-the-border bacon? Canadian Bacon is a many splendored thing. Because it’s so lean, you really only need to heat it through rather than fry it up like our beloved American bacon making it a faster, more convenient breakfast on-the-go option. And honestly, it’s not even really Canadian. The Canadians make peameal bacon. You wanna know what’s nuts? How ridiculously easy MAKING Canadian bacon is. Mercy, though, the ease with which this is prepared pales in comparison to how insanely delicious the end product is. Cured pork loin with mild maple and sage flavours eclipses any commercially available Canadian bacon I’ve ever had in my entire life. My unofficially official taste-testing panel of my husband and sons agreed completely. In fact, this Canadian bacon has been added to not one, not two, but THREE birthday meal requests! I feel obliged to make Canadian bacon pretty Canadian so I added a goodly slug of Grade B dark maple syrup to the brine. It gives it that something special! If you can’t get the dark Grade B, go for a good dark A or a regular A. The darker the syrup, the stronger the maple flavour! Fresh sage is where it’s at, folks. Grab a bundle from the grocery store, or a handful from your neighbor’s garden (with their permission, of course!) but do splurge on the fresh sage. And hot on the heels of my fresh sage argument, I’m going to tell you that dried whole leaf thyme is a-okay here! Fresh thyme is nice, but not quite as crucial to the finished product as the fresh sage. Before dunking the pork loin into the brine, trim as much fat off as you can. You don’t need to be surgical, as it will be easier to remove from the Canadian Bacon AFTER it’s smoked or cooked in the oven. You can reserve the cured, smoked or roasted fat to render and add to beans. I prefer to cut the pork loin to pieces that are a size that fit comfortably into a gallon freezer bag so they stay submerged in the brine like good little bacon. Smoking the brined Canadian Bacon over applewood is FABULOUS and preferable, but if you have no access to a smoker, you can put it in a very low temperature oven (with a little smoke box if you own one!) until the internal temperature reaches 150°F. I’ve included instructions for both methods in the recipe. This keeps in the refrigerator for up to 10 days (courtesy of the pink salt used in the brine) but keeps far longer if tightly wrapped and stashed in the freezer. Speaking of pink salt. I did choose to use it here. I adapted my recipe from Michael Ruhlman’s “Charcuterie” and he makes a pretty powerful argument in favour of its use. If you choose to omit this, understand that it will shorten the shelf life in the refrigerator as well as alter the colour to more of a brown than a pink. It also increases the risk of bacterial growth in the meat. This cured pork loin with mild maple and sage flavours eclipses any commercially available Canadian bacon I've ever had in my entire life. Barely adapted from and with thanks to Michael Ruhlman's Charcuterie. Combine the water, salt, sugar, pink salt, maple syrup, sage, thyme, and garlic cloves in a stockpot. Bring to a simmer and stir to dissolve the sugar and salt. Remove from the heat and refrigerate until chilled all the way through. Trim the pork loin down to fit into two or more gallon sized resealable freezer bags. Insert the pork loin in the bags, then pour the cooled brine into the bags to cover the loins. Squeeze as much air as possible from the bags, then place the filled bags in a high-sided roasting pan and place the pan in the refrigerator for 72 hours. After 72 hours, drain the brine, rinse the pork loins, and place on a rack over a baking sheet. Put that back into the refrigerator for 24 hours to air dry. Hot smoke at 200°F over applewood chips for 2 to 3 hours, according to your smoker manufacturer's instructions, or until the internal temperature of the pork loin reaches 150°F. Preheat your oven to 200°F. Take the air-dried pork loin and put it in the oven still on its rack over its pan, and cook until the internal temperature reaches 150°F. Trim any remaining excess fat, then allow to cool to room temperature. Wrap the pork tightly and refrigerate for up to 10 days or wrap in a double layer of plastic wrap then a layer of foil and freeze for up to 6 months. Need a little help finding some Pink Salts for curing your meat? Here’s a handy-dandy Amazon affiliate link to some Prime eligible Pink Salt! Never been a big fan of Canadian bacon, but this looks so much better. (Of course homemade is always better) Will be trying this out. (Related) Question: are pink salt and salt peter (incorrect spelling) able to be substituted equally? If I need a tablespoon of one, can I just use a tablespoon of the other? Thanks. I learn so much from you blog. Thanks for the response. I can’t find the answer either! Guess I’ll just have to give it a try and see. FYI saltpeter (sodium niTRATE Na NO3) and pink salt (sodium niTRITE Na NO2 are NOT the same and most saltpeter I’ve encountered is potassium nitrate, the active ingredient in black powder. I know that at one time or another they have all been used for the same thing(meat preservation) as well as “salt,” sodium chloride. Potassium chloride is used in “salt” substitutes. Both can be taken internally but whereas sodium chloride can be taken I.V. (saline solution) , potassium chloride will cause cardiac failure within minutes. Interesting. Don’t be misled by the term salt- There are zillions of different ones. I stick with the “store bought” stuff with good results and the price is modest compared with the meat. I’ve heard salt petre is not good for you, and should not be used… cure #1 is safer and no difference in flavor… salt petre is better for cured meat that is intended for no reverberation storage. That is what my little bit of research found. Looooove canadian bacon. It’s one of my favorite pizza toppings (and of course with Eggs benedict. Of. Course.) Your pictures are bootiful. And also? I want that cutting board! 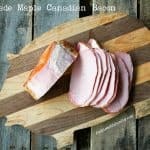 Omg I love Canadian bacon but I’ve never thought to make it – I want to eat all of it!! I think that I actually prefer Canadian bacon over regular bacon. My husband is the “smoker” of the family so I’ll have to get him to make this for us! This made me laugh – especially with the “eh?” We have a lot of family from Toronto and we laugh at that all the time. Ok and now I want bacon! 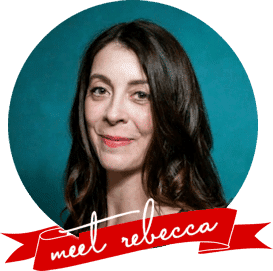 This is great, Rebecca! Question: For those of us without a smoker or smoke box, would adding a little Liquid Smoke at some point in the process have any benefit? Hmmmm. That’s a good question. I imagine it might be nice in a small amount, Uvon, but not having tried it I can’t guarantee results! Please let me know if you do try it and how you like it! You could put in a smoker box as long as you have a good fan over your oven. Mine smokes wite a bit. I have a smoker and make Canadian bacon all the time, have 3 large loins on the go now. I also use a smoker box regularly in my bbq, it adds a nice smoky flavor. You are very talented Rebecca! Great photo instructions. This is AMAZING! I need to make this! Great tutorial! I never ever would have ever attempted to make Canadian bacon at home, you just rock! This looks yummy, and healthier than regular (but also fabulous) bacon. I take it that pink salt is something specific, and completely different from Himalayan pink salt? I knew that book would be fabulous…must get my hands on it. Love this recipe. I’m dreaming of dicing it and throwing it into some fun fall/winter soups. I’m dreaming of taking a bite now! I WANT this Canadian bacon! We have a big smoker sitting in our basement that needs some attention. I would have never considered making my own Canadian bacon..until now. You make it look so easy. Thank you for sharing this recipe. I can’t wait tot try it. Pinning and stumbling. Did you hear that? That was my drool hitting my keyboard. I never met a piece of pork I didn’t like. It’s my “go to” meat. If pigs come down with, like, “mad pig” disease I’m going to need someone to put me down. Let’s talk about this Canadian bacon. Yes, people say it’s just ham, but no…. no… it’s bacon! And I LOVE THIS BACON! Rebecca – I swear – your culinary projects are legendary. 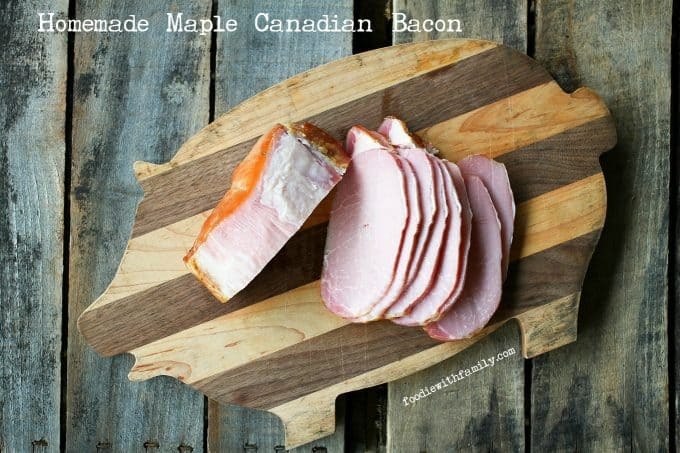 Homemade Canadian Bacon – GENIUS!! I have got to try this! In answer to Rie’s question. They are not interchangeable unfortunately but pink curing salt is readily available online. I got a 5Lb tub from sausagemaker.com a couple of years back when I first started trying to cure my own bacon. (I’m a brit expat in the US and I miss the bacon I am used to). The one you need is Instacure #1. The 5lb tub will probably last me a thousand years but you can get it in smaller amounts from other stores, even William’s Sonoma sells it as “Curing Salt”. To Nancy’s point, it is very important to note that “Pink Salt” is a specific compound formulated with sodium nitrite to prevent spoilage and botulism in curing meat. The Himalayan table salts with a pink hue that are popular in stores like Trader Joe’s these days are NOT the same and will not cure your bacon safely. I have my pork loin brining and there is some brine leftover and I remembered the costco pork sirloin roasts I have in the freezer. I wonder how they would work brined and smoked. Any suggestions or advise? Love this sight and have it on almost daily. I would like to know what type of pink salt you used? I used #2 Prague powder from my local butcher & followed the recipe exactly. The bacon turned out extremely salty to the point of beinng inedible. Second batch used only 3/4 cup kosher salt and 1 tsp #2 Prague powder (pink salt) and it turned out perfect! Also basted with a 50\50 maple syrup & Canadian whiskey blend every 30 min incredibly tasty!!! … It’s my understanding that not all pink salts are the same. There is Prague #2 and Prague #1 among others! I use the same ratio of pounds of meat to pink salt as specified in Michael Ruhlman’s charcuterie in his Canadian Bacon recipe. and would this brine work on pork belly to. Do you mean to make a standard bacon? I imagine so but haven’t tested it and so can’t vouch for the potential results. looks amazing and sounds great! do you know if you can you substitute tender quick for the pink salt? if so, any idea on amount? Hi Jeff- Theoretically I’m sure you can, but I’m not familiar with the equivalent amounts of Tender Quick and Pink Salt. If you have a good meat shop nearby who makes their own bacon, they might be a good resource! I’d love to know what you find out, though! I started a 2.5 piece of pork loin on Monday and I Finished it yesterday, Thursday. I used lots of fresh cracked black pepper, some garlic and some vanilla along with the other necessary ingredients. Someone asked if they could use liquid smoke. Because I was too lazy to take out my smoker, I used 1 tsp of liquid smoke which was added to my brine in which I only used a half gallon of water. I came out perfect, best tasting smoke flavored piece of bacon I have ever tasted. I will never buy store bought again. It was so tender and juicy. The absolute best. Storage question for you…I am preparing to make this for the first time soon and wanted to check about this…have a small family and will be freezing most of it. Do you slice all of it and freeze that way or freeze it whole and slice when defrosted? Hi Ellen, Excellent question. My personal preference is to freeze it in blocks and then thaw and slice. The reasoning (at least as I see it) is that the more intact something is going into the freezer, the better it will hold up over time. Not that it gets to stay in my freezer for too long, but I feel like it is less likely to suffer freezer burn when frozen properly in the large pieces. Could you substitute Tender Qwuick for pink salt?? I honestly would hesitate, Jamie, because I don’t know whether they’re equivalent. If you can find a reliable source that says they are, I’d say go for it, otherwise, I’d order the pink salt! Absolutely different. Himalayan pink salt has no sodium nitrite and is not for curing. From other sites on making this, don’t substitute the salt, one idea of the pink is, the meat gets a pink tint inside as opposed to grey in color, presentation. Non of the sites recommend substituting. Here’s from a recent graduate (me) from a weekend sausage making and meat smoking seminar. I can try to lay out the points on the pink salt. In the USA the meat industry is regulated by the FDA. The Sodium Nitrite (NOT Nitrate) must be dyed to differentiate it from regular salt so the industry has decided to dye it pink. This stuff goes by names like Prague powder #1, Instacure #1. It is is 93.75% salt and 6.25% Sodium Nitrite. Reason they do this because for a sausage recipe you only put in about 1/4 teaspoon or roughly 4 grams of this pink salt into a pound of meat to cure it and for it to be within FDA safe limits for human consumption. If you used pure sodium nitrite you would not be able to accurately measure it for small quantities of meat. Now in Canada there is no law that states mandatory dying of of Instacure. All the curing salts are white. In Edmonton (Canada) we are fortunate to have at least 3 butcher supply places that have this on the shelf (Halfords, Butchers and Packers, High Calibre, google them for more info). As a final thought there are more curing mixes out there. You will see stuff like general cure, FS cure. There are NOT 6.25% sodium Nitrite. You will have to adjust your amount of cure per pound of meat to be within safe limits for smoking meats. Remember you only smoke the loin until 150F internal temperature. The FDA safe limits for cooking meat is to be above 162F internal temperature to kill off botulism. The curing salts have a natural botulism killer in them. 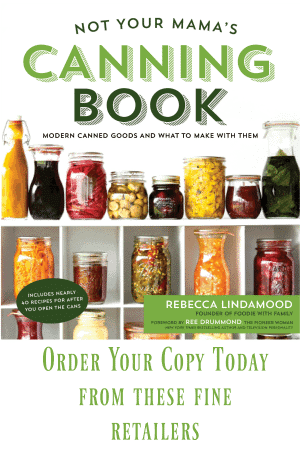 A hundred years ago there was no fridges, you needed curing salts to extend the shelf like. Now it is purely symbolic. That’s why a chunk of pork loin smoked without curing salts is white and one that is cured is pink. It all has to do do with the chemical interaction with the hemoglobin in the meat. Im wondering if the cut Im using is only 3 lbs i should adjust the quantities for the brine or not? someone made a comment about the amount of pink salt. Just a word of caution. There are a variety of nitrate preparations on the market. Make sure you read the label on the one you purchased and use the amount indicated. I have bought something at a butcher supply store that is called super cure. I only use 1.8-3g/Kg of meat, that is not a lot, not hardly a teaspoon. So whatever recipe I use, I calculate the amount of super cure that I need based on the ratios it lists on the package, then I proceed with the recipe. Also on the note of nitrates, I have read a lot about it and from what I can tell, the biggest contribution to most peoples diets is from the nitrate that naturally occurs in their tap water. Compared to celery seed extract, when you measure out commercial nitrates, you know what you are getting, using the celery preparations you cannot be sure of the final concentration and cannot therefore be certain that you are preventing bacterial growth. You may also be getting nitrate levels way higher than any commercial preparation may give you. Life is a world of chemicals, naturally occurring and man made, not all natural things are beneficial, and not all man made things are bad for you. And by the way, this Homemade Canadian Bacon is really great and that is what it is all about. We have decided that using a pork loin this way is something that we prefer to roasting it all. We prefer the versatility in using the bacon up this way, rather than just roast pork leftovers, breakfast sandwiches, alongside pancakes or waffles, or cut up in them, sub for ham in western omelettes, use in Chinese stir fry instead of BBQ pork, use in homemade or store bought pork and beans, cube it up into lentil or split pea soup, warmed up and served with mustard in a sandwich, the list goes on!. How many sprigs or ounces of sage is in a bunch? 3 or 4, give or take. It’s really not a hard and fast number. Your write up says to leave in brine for 72 hrs yet the book you quoted from says 48 hrs.just wondering why you changed time. If not using pink salt, do you increase the other salt? Harvey came along about that time and took everything. I haven’t had the nerve to try again but it still sounds good. Will try again soon. Nice recipe and I followed most of it but I feel I must warn everyone here. You should use at most 1 (level) teaspoon of pink salt (prague powder #1). 1 level teaspoon will do 5lbs of meat. You have 8 teaspoons listed which is WAY too much to the point of possibly causing health problems. Pink salt is toxic and has to be measured accurately. If you are referring to something other than prague powder #1 or insta cure #1 please specify and update the recipe. Besides that it looks great and I’m looking forward to smoke mine in another day…. Hi Matt- Actually, I’m confident in keeping this recipe as is since it uses the exact ratio of pink salt called for by Michael Ruhlman in his excellent book “Charcuterie”. It is 1 1/2 ounces/42 grams pink salt (or 8 teaspoons) to 1 gallon of water and 1 1/2 cups/350 grams Morton’s kosher salt, among other things. I would say for your Peameal Bacon 8 teaspoons of Pink Salt #1 is not right for 4 lbs of meat, manufacture of pink salt : 1 teaspoon per 5 lbs of meat. Hi Leo- Actually, I’m confident in keeping this recipe as is since it uses the exact ratio of pink salt called for by Michael Ruhlman in his excellent book “Charcuterie”. It is 1 1/2 ounces/42 grams pink salt (or 8 teaspoons) to 1 gallon of water and 1 1/2 cups/350 grams Morton’s kosher salt, among other things. 8 teaspoons of cure #1 is a ridiculous quantity (borderline poisonous) and about 10x more by weight in grams than you actually need for an entire pork loin. Learn how to cure meat and learn the proper ratios of salt, sugar, and cure #1. There are books. There are websites. And there is this recipe you posted which quite frankly is garbage, since I see poor people showing up in meat curing forums with a link to this recipe and wondering why it’s inedible. Hi Sam- Actually, I’m confident in keeping this recipe as is since it uses the exact ratio of pink salt called for by Michael Ruhlman and Brian Polcyn in their excellent book “Charcuterie”. It is 1 1/2 ounces/42 grams pink salt (or 8 teaspoons) to 1 gallon of water and 1 1/2 cups/350 grams Morton’s kosher salt, among other things. I can personally attest to it being quite edible as can the many people who have eaten it from this recipe. You are, however, beyond brusque into the realm of rude. I’m sure you feel justified -rude people most often do- but I won’t let that stand here. If you’d like to try this discussion again, explaining why you think Ruhlman is wrong instead of throwing verbal punches, I’ll let you give it another shot. Otherwise, I think we’re done here. As far as I’m concerned, I would have blackballed “Sam” outright. No second chances for such blatant disrespect, particularly on a public forum. Back to the subject at hand: What I think I’m reading from these references to FDA and package-wrapper directions or measures of 1 teaspoon of pink salt to 4# or 5# of meat product is intended for sausage-type uses (recipes), where the condiment is placed directly into the mix of the meat product. Your use and measure as a brine ingredient is totally different, and much more dilute. Thanks so much, Chef! I appreciate your support and backup. Hi! I have some pork loin brining and now I’m reading that the Himalayan salt I used is not actually the same as what was intended. Oops! First time curer. Is my pork still safe for consumption? It just won’t last as long perhaps? No smoker. Applewood smoke flavor very appealing. Wondering if possible to use half water and half apple cider? Complete neophyte, wanting to learn. Hi Mike- You can definitely try subbing apple cider for half of the water. If you don’t have a smoker on hand, definitely add some of the liquid smoke! Here’s an affiliate link for some liquid applewood smoke. Is the bacon ready to eat after smoking or does it need to be cooked further? Hi Virgil! You definitely need to cook it further after smoking. The smoking is basically to flavour the bacon! That’s a lot of Prague Powder, 8 tsp, for 4-5 pounds of meat. Can that be cut in half? Hi Ed- This is the same ratio of pink salt that Michael Ruhlman and Brian Polcyn use for their Canadian bacon in Charcuterie, so I am confident with the quantities. Please remember it’s being mixed into the brine which is then discarded vs. being stirred into the sausage as an ingredient. Thanks, Joe!! I agree that it’s better than any stuff I’ve ever bought! It’s so easy, too. What’s your average cooking time for the oven version? Hey Patrick! You’ll just need to go by temp on that. I’d advise using a probe thermometer that you can leave in the loin while it bakes! Thanks for the recipe however in Canada there is no such thing as Canadian bacon. It’s a USA term. We have peameal bacon and back bacon. Both are brined for up to 5 days the difference being that back bacon is lightly smoked and peameal bacon is coated in a layer of yellow cornmeal (originally ground yellow peas were used). Great recipe, was wondering how I was going to cure this loin and now I know. 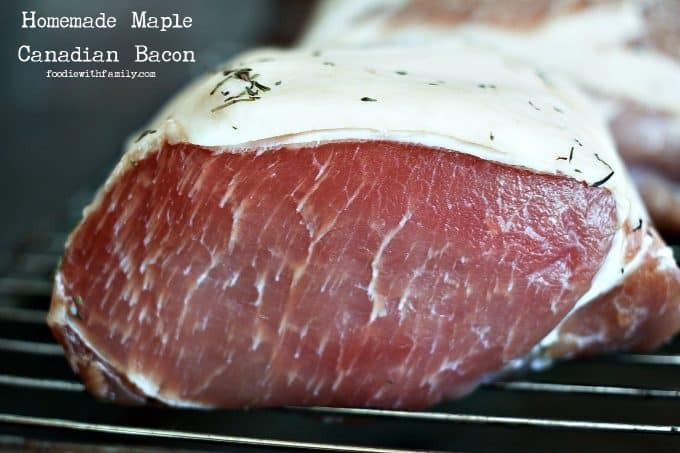 An interesting fact regarding this Canadian bacon, I had never know what it was until I started looking for recipes to cure a pork loin and came across several talking about Canadian bacon. I just gotta say I have lived in Canada my entire life and have never had it or seen it sold, go figure Eh! It’s good stuff!! Let me know how you liked it after you try it! A friend of mine cures, and smokes, a lot of meat, so I asked him if I could borrow the 42 grams . 8 tsp of pink salt your recipe says to use. His labeled bottle of pink curing salt says 1 tbs per 5 pounds of meat. That’s about 1/10 th yours. Any idea why the discrepancy? Hey Richard- This more than one kind of pink curing salt on the market so the first step is to see whether your friend uses the same sort as I do. Other than that, my ratio is identical to that of the Canadian Bacon in Michael Ruhlman and Brian Polczyn’s book Charcuterie, so I’m pretty confident that it’s good. It’s part of a brine rather than being applied directly to the surface of the meat which means most of it is discarded. Thanks. You’re for sure a sweetie !! 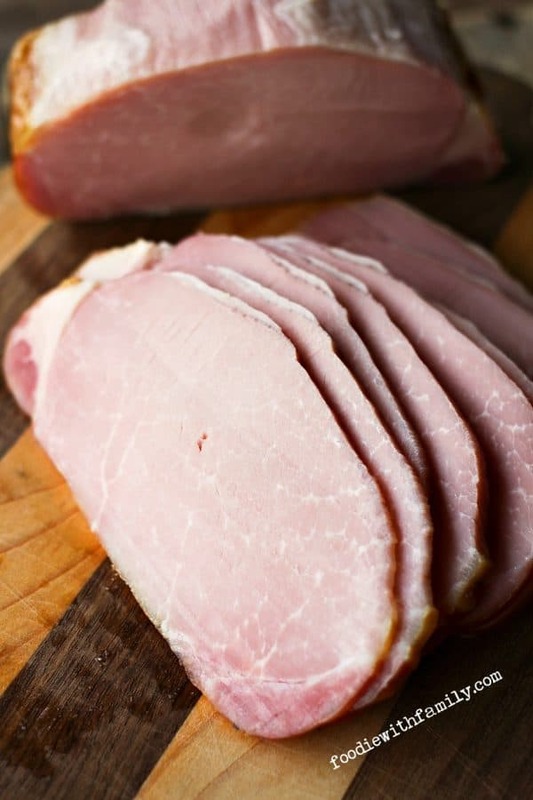 This is a great recipe and has become my “go to” Canadian bacon recipe. It’s become a family tradition.. .
“IF” you have a smoker grab up a few blocks of your favorite cheese (mine is swiss which pairs especially well with this bacon recipe) and cold smoke some up for some great cheese, meat and cracker trays for the holidays. Dudette, this is beyond cool and awesome. I cure and smoke tons but this recipe is an amazing distillation of it all. Well done. I give this to all my friends and they love me. CLEARING UP THE PINK SALT CONTROVERSY…. I commented earlier about the massive amount of pink salt being used. Well here’s the deal. Pink salt is intended to be used in a DRY brine and rubbed onto the meat. That is what the 1oz to 25lb of meat recommendation is for. When diluting in water (wet brine) you need a LOT more pink salt to get the same concentration (parts per million). The amount of pink salt in this recipe does check out and here is where I got my information from. Thanks for coming back and clearing that up, Matt! 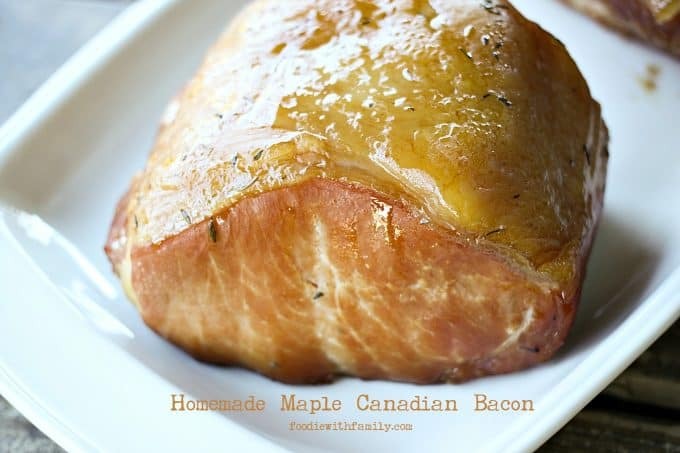 Ive never been a big fan of Canadian bacon until now….your recipe is great…thank you…. Thank you for sharing your recipe. Our whole family love bacon, preferably with less fat. I am going to try this. May I ask can you cook this in the instant pot. Finish it off in the oven. Hi Sahron- I do not think this would work well in the instant pot. I prefer the low dry heat in the oven for the initial cooking process, I think. That said, if you try it in the IP, please let me know how it works for you! I ended up with salty roasted pork loin. Ok. Do you leave the cured pork uncovered for those 24 hours in the fridge or cover? Hi Jason- It is intentionally left uncovered on a rack over a rimmed sheet pan to allow it to air dry. This helps it absorb the smoke when placed in the smoker. 🙂 Happy Bacon-Making! I actually made this and followed the directions exactly, even smoked it. This Canadian bacon is so good! I’m so glad, Brad! Good stuff and so easy, right? The pink salt should be added after simmering and cooling not before. Heat activates the pink salt and you don’t want to do that until you smoke the meat!